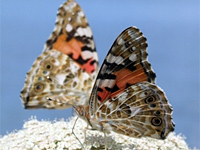 Create and manage categories in Curator of Lepidoptera. Removing a category will not remove content. Create and manage announcements in Curator of Lepidoptera. Try to limit the announcements to keep them useful. With approximately 8,712,000 specimens in 80,000 drawers, the Museum's British and International collections of Lepidoptera are housed in a purpose-built facility in the Darwin Centre. 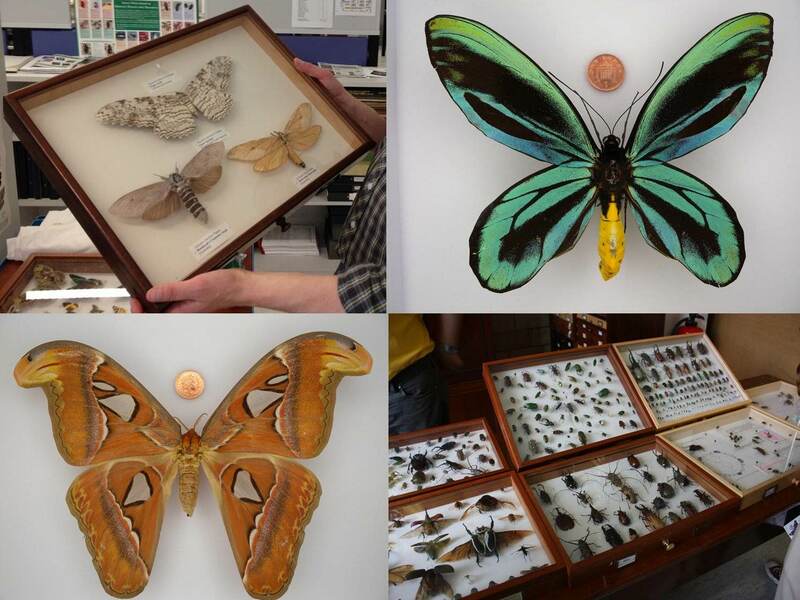 Read our Curator of Lepidoptera blog to discover some of our amazing specimens and find out how they are used by an international community of researchers. 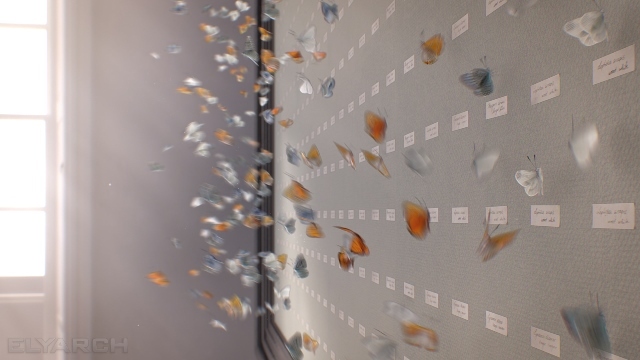 With the forthcoming opening of our Sensational Butterflies exhibition in April, and the digitisation of our collections progressing gradually and efficiently, I thought it would be welcoming and encouraging to post a 3D art video on butterflies. The video, titled “Gone?”, was made by Graham Macfarlane and Elitsa Dimitrova of Elyarch, a small but well-established and creative digital company, based in London. 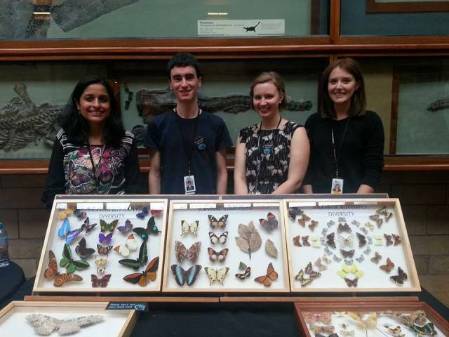 I met Graham and Elitsa during the last Science Uncovered evening at the Museum in September, when they approached the Lepidoptera forest station to admire our displays and to chat about flight in Lepidoptera. They were particularly curious to know how butterflies and moths hold their legs during flight. The Lepidoptera display during last year's Science Uncovered. How do lepidopterans hold their legs while flying? “Difficult question!” I replied with a pondering smile. As a matter of fact I don’t think I had given the topic much consideration before then. A few days later, after talking with some colleagues and having done a little research on the subject, I sent Graham and Elitsa an email saying that probably, in insects, the position of the legs during flight differs slightly according to groups. Presumably, as in other insects, lepidopterans' legs hang more or less down under the body, and very likely their position changes according to the particular moment of flight, ie migration versus flying while feeding or moving short distances, or during courtships etc, and I suggested to look at images and slow motion videos of flying insects on the internet. A few weeks later they sent me the art video with thanks for the information I supplied, so I thought I'd share the video with you in case you haven’t seen it yet. 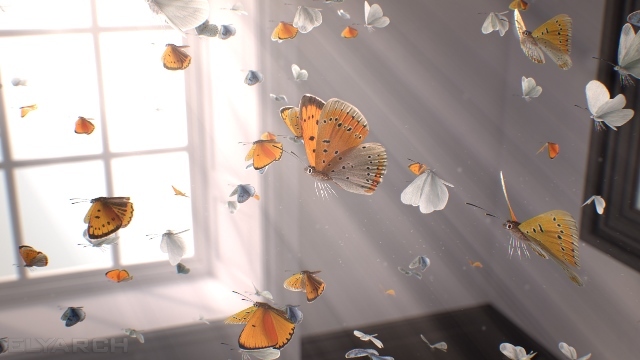 I really enjoyed the video; it's well-designed and captivating, even if the legs of the flying butterflies are probably not portrayed 100% correctly. But let’s give the artists the benefit of poetic licence, and it shouldn’t matter after all, as long as the work entertains and stirs something in the viewer. Which I think “Gone?” does. I like how the butterflies are taking off from an immobile position, as if they are all dormant inside a collection box, and a kind of imperceptible and secretive command suddenly wakes them up. This makes me think of our collections, and how the digitisation projects currently taking place in our Museum are a sort of revival of our specimens and of all the useful data associated with them. A virtual awakening which makes our specimens more accessible. But what I like most about the video is that it carries a nice message of hope, and it’s not just about butterflies, but also about any other organism we share our planet with: it’s an invitation for us all to reflect on the beauty, complexity and fragility of the natural world, and the responsibility each of us has to preserve it. A philosophy that is ingrained in the values of the Natural History Museum, as we have always aspired to promote the discovery, understanding, responsible use and enjoyment of the natural world. The vivid beams of light shining on the gliding butterflies and the shimmer created by the dislodged tiny scales of their wings give a wonderful sense of hope and awakening. National Be Nice to Nettles week took place 14 - 25 May 2014, and the Museum will be running its own be nice to Nettles Weekend on 31 May and 1 June 2014. It's a free event, open to everyone and there will be a range of displays, activities and talks in the Wildlife Garden and inside the Museum. You can read more about the Wildlife Garden activities on Caroline's blog. It's easy to label the nettle as an unfriendly plant, after all its stinging property and tough habitus don't help much in giving it the elegance, gentleness and fragility we wish to see in beautiful plants with delicate flowers. 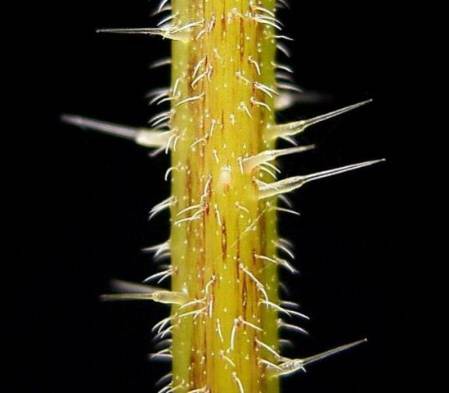 The ability to sting is due to the fine hair-like structures covering every part of the plant. These hollow hairs and their swollen base contain a cocktail of chemicals, such as histamine, formic acid, acetylcholine and others. The hairs are very brittle and break easily, and once broken the sharp fragment that remains will readily enter the skin dishing out the irritant mixture, this causes the familiar and unpleasant rash. The hairs on the stinging nettle are a great defence against many herbivores and can cause a severe rash if brushed. The genus Urtica to which the nettle belongs comprises around 80 species distributed in tropical and temperate regions throughout the world. Only 2 species are found in the UK, the perennial stinging or common Nettle (Urtica dioica) and the more local, annual small nettle (Urtica urens). There are a few differences between them. U. dioca has almost invariably separate plants bearing either male or female flowers, while U. urens has both male and female flowers on the same plant. The latter is also smaller and its leaves are less pointed and more deeply toothed. But they do have a thing in common: the propensity for stinging! Common nettle on top and small nettle at the bottom. Note how the leaves of the common nettle are more pointed and less deeply toothed compared to the ones of the small nettle. However, there's more to nettle than its bristliness and if we consider carefully we would discover that the nettle is in fact an unadorned but interesting plant with many useful properties, and which plays a very important role in nature. In fact in the UK over 100 species of insects have been recorded feeding on nettle (see the list here). This of course means that the community of organisms depending on - or somehow benefitting from - nettle patches is indeed very large; just think of all the birds, amphibians, predaceous insects, arachnids and others creatures which readily take advantage of this tasty myriad. 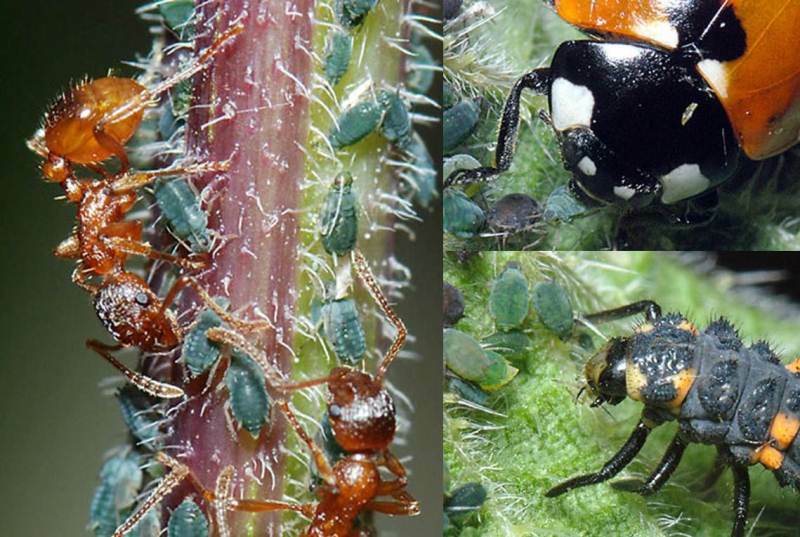 Aphids love nettle, particulary new shoots. 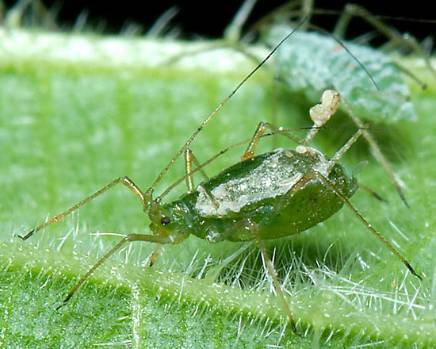 The picture shows a common nettle aphid (Microlophium carnosum) on nettle. Many insects and other organisms benefit from nettle. In this picture on the left Common Red ants (Myrmica rubra) tending a colony of aphids on nettle. 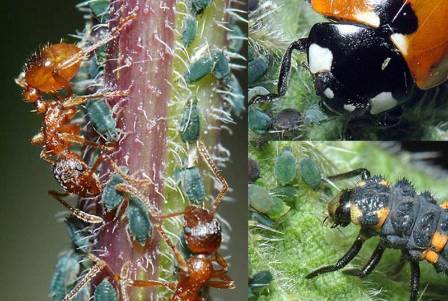 On the right adult and larva of 7-spot ladybird (Coccinella septempunctata) feeding on aphids on nettle. Nettle also provides an excellent fibre which can be easily woven, spun and twisted to make clothes, sacking, fishing nets and even knickers - although I'm not sure about a pair of nettle knickers as it sounds too much like wearing one of those religious cilices for repentance and atonement. Several species of nettle are used to produce fibre for making textile and clothing. The leaves and other parts of the nettle plant are rich in compounds which have remarkable nutritional and medicinal value, and for centuries nettle has been used as a versatile culinary ingredient and as an alternative to conventional medicines. It can be used to prepare a fertilizer rich in nitrogen and iron. It can be chopped and mixed in a compost heap to help speed up the decomposition process. Nettle in the garden can be planted to lure aphids (these sucking green insects love nettle) therefore reducing the risk of other garden plants being attacked, moreover the aphid will also attract beneficial insects and birds which readily feed on them. So it is not surprising that nature lovers and conservationists organise public events and fairs to celebrate the nettle's qualities and educate people in the importance of this plant. And the Museum will be again joining in the celebrations with a weekend dedicated to this formidable plant. 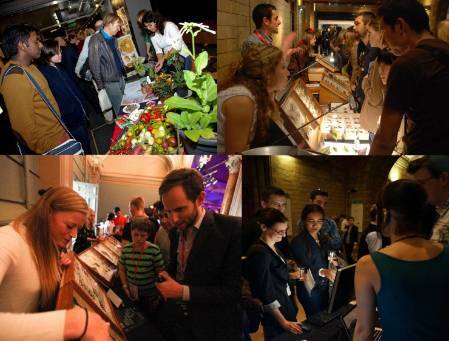 Nettle Weekend is taking place on 31 May and 1 June at the Museum. It's a free event, open to everyone and there will be a range of displays, activities and talks in the Wildlife Garden and inside the Museum. So come and visit us. I'll be there too, in the Wildlife Garden near the pond, with a display about insects and nettle, with emphasis on moths and butterflies of course. 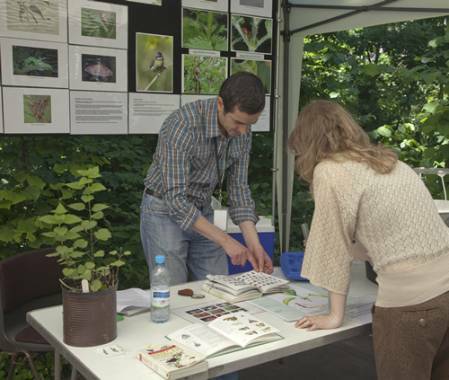 The display about insects and nettle in the Museum's Wildlife Garden. 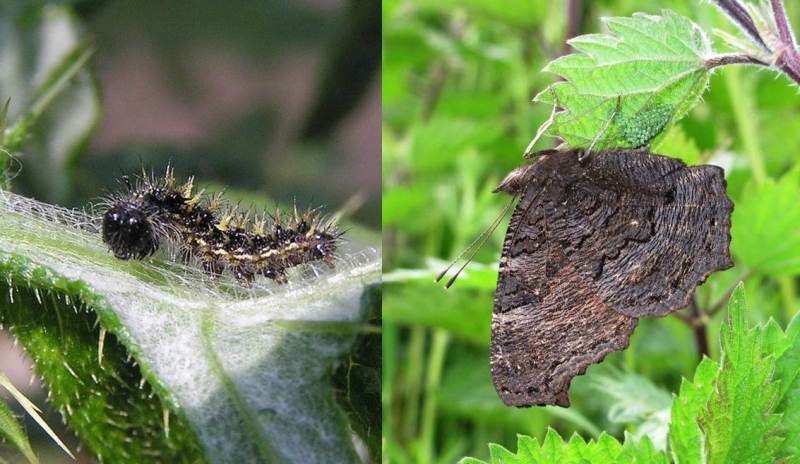 According to the Database of Insects and their Food Plants, in the UK there are 56 species of Lepidoptera whose caterpillars have been recorded feeding on nettle. Most of these species are polyphagous, this means that the caterpillars feed on a variety of host plants, which are often - but not always - related. However, for the following species of butterflies and moths nettle seems to be the favourite food-plant. The caterpillar of the painted lady (Vanessa cardui), on the left, feeds mainly on thistles, but occasionally uses common nettle, mallow and other herbaceous plants as food. On the right a female peacock (Inachis io) is laying eggs on nettle, the primary larval foodplant for this species. The garden tiger (Arctia caja), on top, is a polyphagous species whose larva feeds on various herbaceous plants, including nettle. While the snout (Hypena proboscidalis) caterpillar feeds preferably on nettle. Thanks for reading and I hope to see you at the weekend! In the last few posts of my blog I have been talking about the Museum’s holdings of hawkmoths, which amount to 289,000 specimens, and how the Lepidoptera section is dealing with the re-housing, care and accession of this important group. 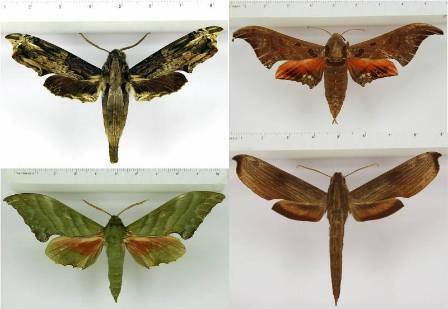 This will be my last post related to this subject and in concluding I want to talk about a private collection of hawkmoths, specifically the Cadiou Collection, which has enriched and transformed the Museum lepidoptera holdings. This large and valuable collection was purchased by the Natural History Museum in August 2008, thanks to the generous sponsorship of the Rothschild family, the de Rothschild family, the John Spedan Lewis foundation, Ernest Kleinwort Charitable Trust and members of the public. 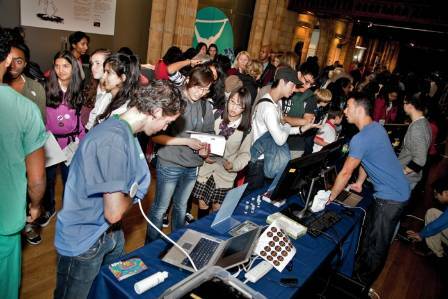 The Cadiou Collection with its 230,000 specimens was acquired for the nation and for science in August 2008. Dr Jean-Marie Cadiou was a non-professional lepidopterist with an interest in hawkmoths. 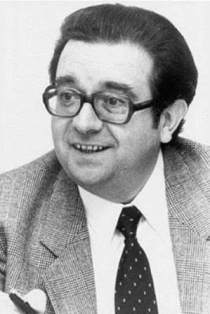 Cadiou began amassing his collection while working for IBM in California in the late 1960s, and continued during his subsequent employment with NATO and the EU Directorates General. At the time of his unexpected and untimely death in May 2007, he had authored or co-authored 32 scientific papers and one book, described 65 species and subspecies of hawkmoths and managed to create an extensive collection of thousands of specimens. 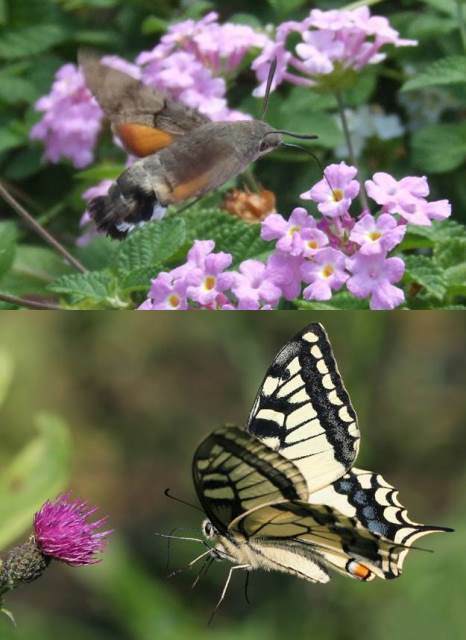 Four hawkmoths described by Cadiou. From top left clockwise: Eupanacra busiris ssp. myosotis (Sulawesi), Orecta venedictoffae (Ecuador), Xylophanes haxairei (French Guiana, Colombia, Ecuador, north Brazil) and Rhodoprasina corrigenda (Thailand). The Cadiou collection contained an estimated total of almost 230,000 pinned and papered specimens and when this collection was put on sale after Cadiou’s death the Museum couldn’t miss the chance to acquire it. The majority of the Cadiou material was post-1970 with precise locality data. The collection contained at least one genus and 99 species and subspecies not represented in the Museum. It was also rich in species of which the Museum had only five specimens or fewer (at least 200). 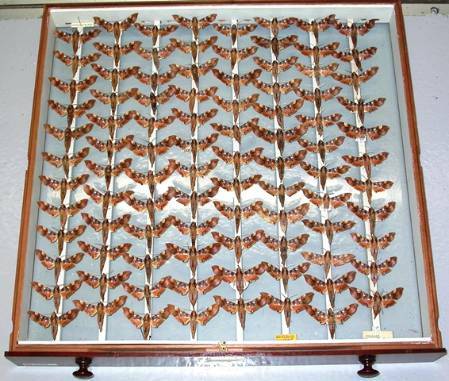 In comparison the Sphingidae collections of the Museum at that time comprised 60,000 pinned specimens, many of which were over 100 years old. Two colleagues of mine went to Belgium to pick up the collection in Cadiou’s house. 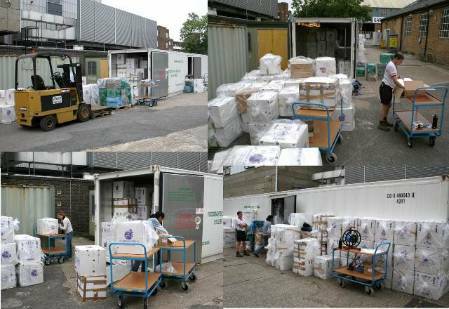 The plentiful and various types of boxes containing the specimens had to be packed into large cardboard boxes for ease of transport. 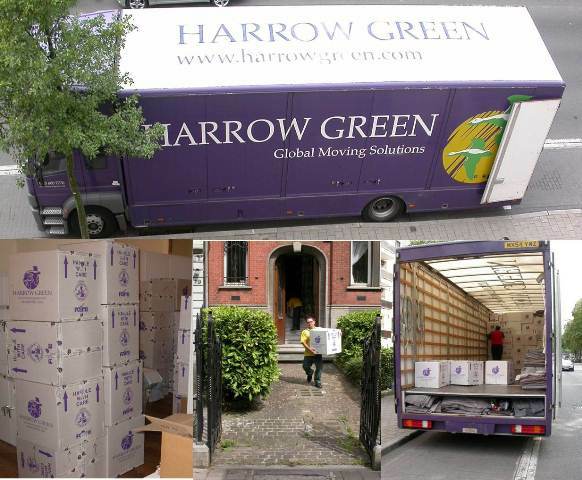 430 cardboard boxes containing the collection were loaded into a hired large track for transport. Meanwhile back in the UK a large freezer was hired to quarantine the material before transferring it into the collection areas. After 21 days in the freezer at -40°C, the boxes were finally moved in the collection area. 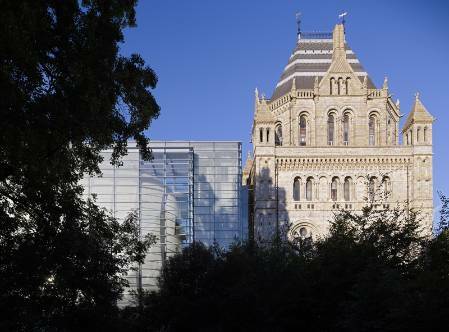 At that time the Lepidoptera collection was housed in one of the Museum's storage places in Wandsworth, while the new building that would have housed the entomology and part of the botany collections, namely the Darwin Centre, was being built in South Kensington. Once in the collection, we started the process of transferring the pinned specimens from various kind of boxes and drawers of the Cadiou collection into refurbished Rothschild drawers. 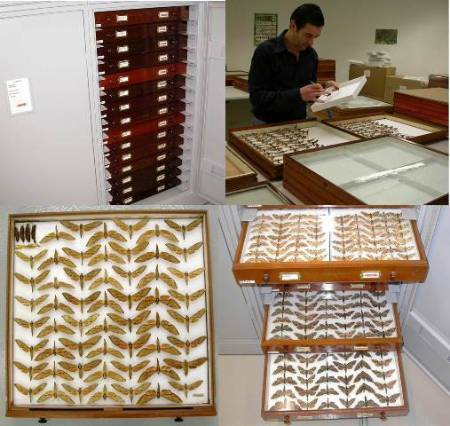 Many curators and a volunteer were involved in the transferring of the material, and eventually, just before the Lepidoptera collection was ready to join the other entomology collections in the newly built Darwin Centre, in South Kensington, all pinned specimens from the Cadiou collections were transferred into Rothschild drawers and ready to be moved in their new home. Our long-term volunteer John Owen transferring some hawkmoths from Cadiou’s boxes into Rothschild drawers. At the end we had filled around 750 Rothschild drawers with pinned Sphingidae (top) and an extra 70 different types of drawers with non-sphingid Lepidoptera (bottom), all these from the Cadiou material. 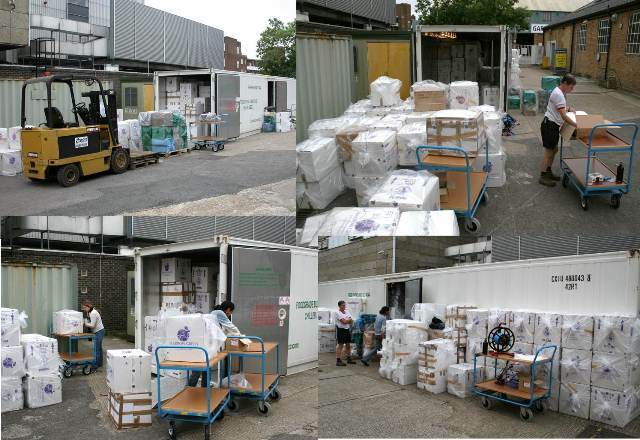 We are now left with 120 boxes containing papered material, some of which has already been sent to Prague for mounting. The actual amalgamation of all the Sphingidae in one large collection started in May 2010 and is still in progress. 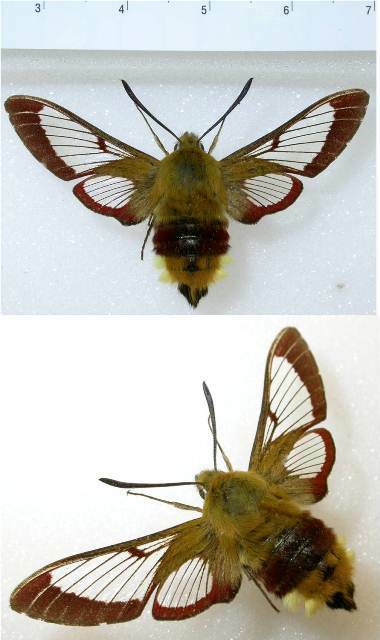 In this project I work alongside Ian Kitching, one of the researchers in our section and a world expert on Sphingidae. The aim of the project is to re-house the specimens from the main, supplementary, accession and the recently purchased Cadiou collections, into one collection inside refurbished Rothschild drawers. 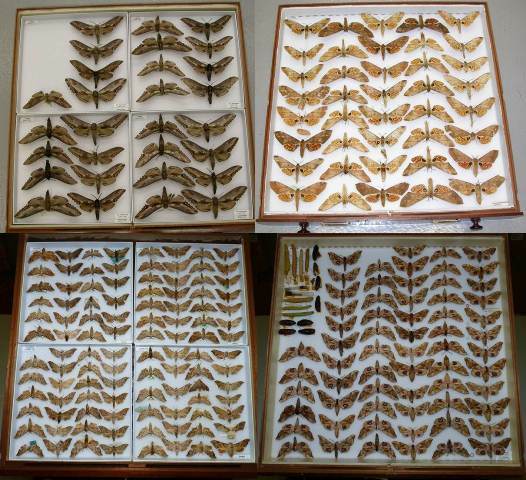 Some of the re-housed drawers of Sphingidae. From top left, clockwise: Langia zenzeroides ssp. 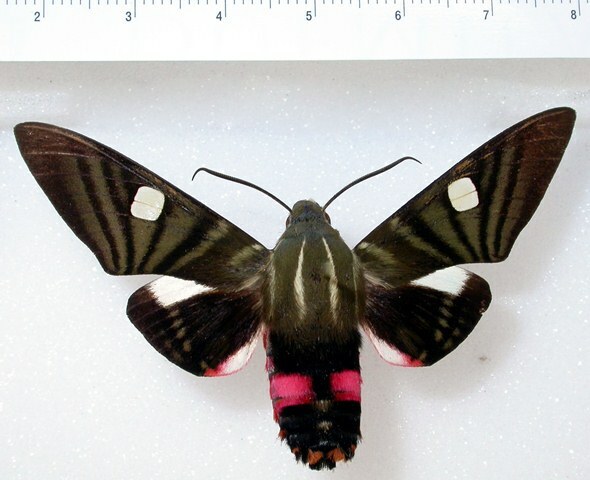 formosana, Platysphinx stigmatica, Smerinthus ocellata ssp. atlanticus, Falcatula falcatus. I am transferring the specimens using a relatively new way of arrangement which consists of rows of specimens facing each other. This method is particularly easy to carry out thanks to the falcate shapes of the dry pinned sphingids and has helped in increasing the number of specimens that fit in each drawer, therefore reducing the total number of drawers and ultimately the space necessary for their housing. 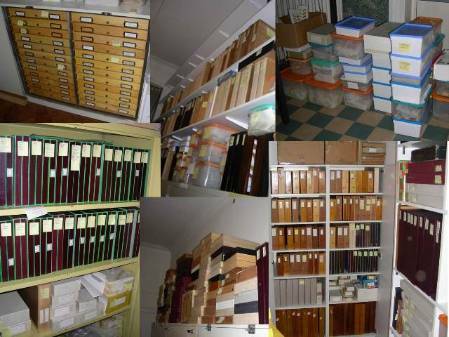 By February 2014 I created 877 Rothschild drawers of hawkmoths from merging main, supplementary, accession and Cadiou collections. A total of approximately 45,000 specimens have been transferred so far. These include 105 genera out of a total of 207. The re-housed taxa have all been labelled and had their location, with other important details, recorded in our electronic database. Allow me to make a plea, before concluding. Of the 207 genera of Sphingidae so far known 206 are represented in our collections. The only one currently missing is the genus Baniwa which has only one species described in it, Baniwa yavitensis, from Venezuela. We really would like to have one! However, this is not an invitation to collect it from the wild as this species is very rare and almost certainly protected. We certainly don’t endorse indiscriminate and illegal collecting, and specimens entering our collections need to be accompanied by a regular collecting permit. 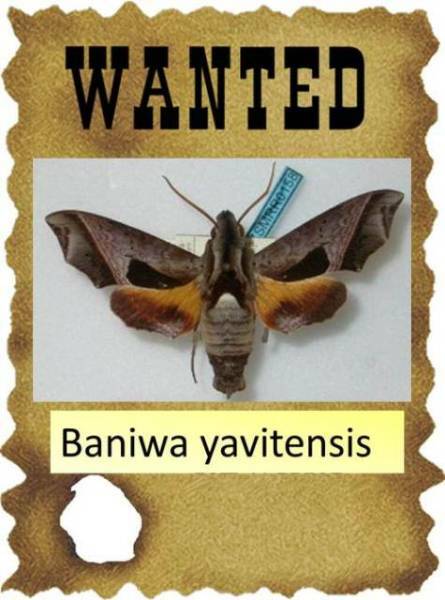 So, if there are some collections out there with surplus specimens of Baniwa, keen on giving one away (I can hear someone laughing mockingly), please get in touch. We shall provide it with a comfortable, and most of all protected, accommodation. That’s it! I shall now officially relieve you from any further information about sphingids…well, only for a while though, because as you may have noticed, I have a soft spot for hawkmoths and can’t resist conversing regularly about them. Thanks very much for following this blog trend on hawkmoths; I shall keep you posted with more news on lepidopterans and the Museum’s collections. One last thing, don’t forget to visit our Sensational Butterfly exhibit, which opens on 3 April 2014. There are also some moths in the house and who knows, you might be lucky enough to be brushed past by a skilful and hurried flyer…did someone just mention a hawkmoth. I photographed this beautiful Cephonodes hylas resting and feeding on the flowers of the a Scarlet Milkweed (Asclepias curassavica) in a previous Butterfly Exhibit here at the Museum. Perhaps we'll be able to enjoy some nice hawkmoths this year too. The re-housing of the Museum’s hawkmoths collection, one of my curatorial responsibilities, has been the subject of the last couple of posts. I talked about the transferring of specimens from outdated or transitory drawers into new, more permanent drawers, and of the amalgamation of the old Museum’s collections with newly acquired material, with particular reference to the collection of hawkmoths (Sphingidae). 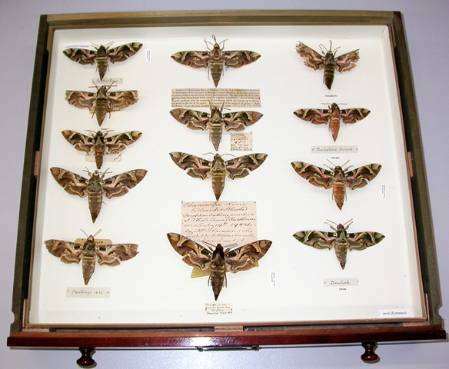 I have also introduced some of the species from the Museum’s extended sphingid collection, consisting of around 289,000 specimens and, in this post, I would like to briefly tell of the history of the Museum's collection of hawkmoths. However, before I start delving into the past, I’d like to finish with the introduction of some of the species of hawkmoths I began in the previous post… so here are some other fascinating sphingids. Some hawkmoths have a short and stout body, transparent wings, a distinct pattern and behaviour that make them look like bees or wasps. 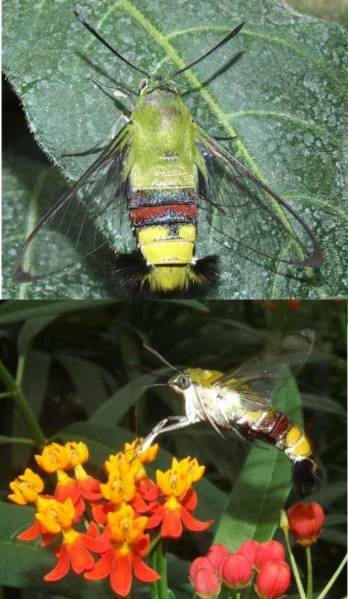 This is Cephonodes hylas, a daily flying moth, widely distributed in Asia where it is often found in urban parks and gardens attracted by Gardenia, one of the caterpillar's food plants. When the adult moth emerges from the pupa, the wings are entirely covered with greyish scales. These come off in a little cloud after the first flight. Another hymenoptera look alike is Hemaris fuciformis. This little and pretty hawkmoth, with its plump body covered by yellowish and reddish hairs, and its transparent wings, looks very much like a bumble bee, and it flies rapidly like one too! This specie is widespread all over Europe eastward across northern Turkey, northern Afghanistan, southern Siberia, northern Amurskaya to Primorskiy Kray and Sakhalin Island. It has also been recorded from Tajikistan and northwest India. 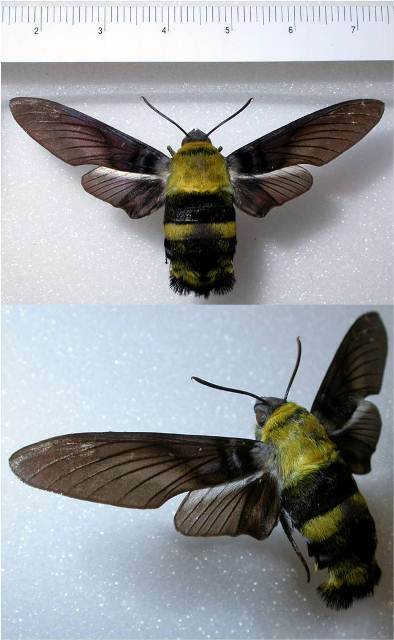 Sataspes infernalis is another daily flying hawkmoth that very convincingly mimics a carpenter bee. 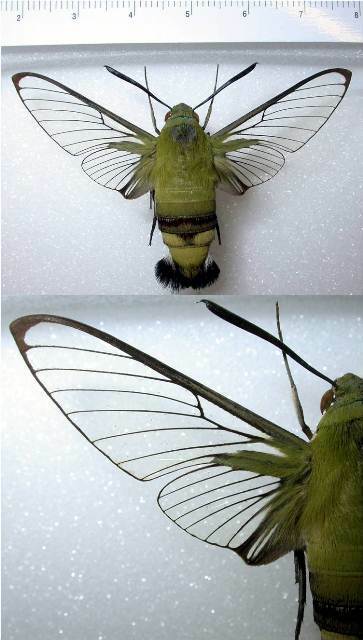 Its wings are devoid of scales and are darker, more opaque and somehow iridescent compared to the previous two hawkmoths. This species is distributed in India, West China, Burma and Borneo. 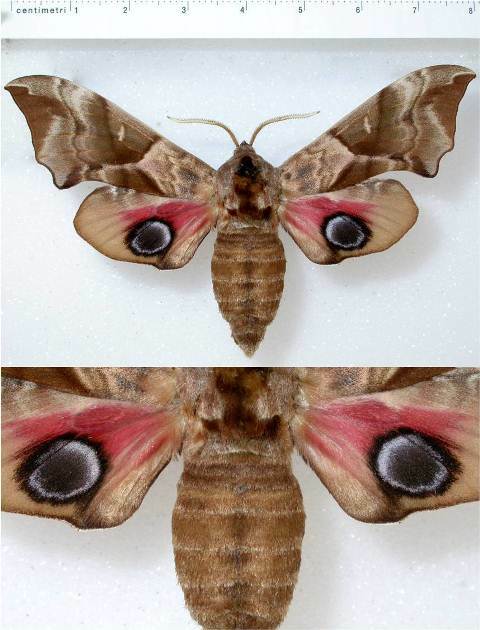 Eye-spots are a common feature on the wings of Lepidoptera and hawkmoths are no exception. 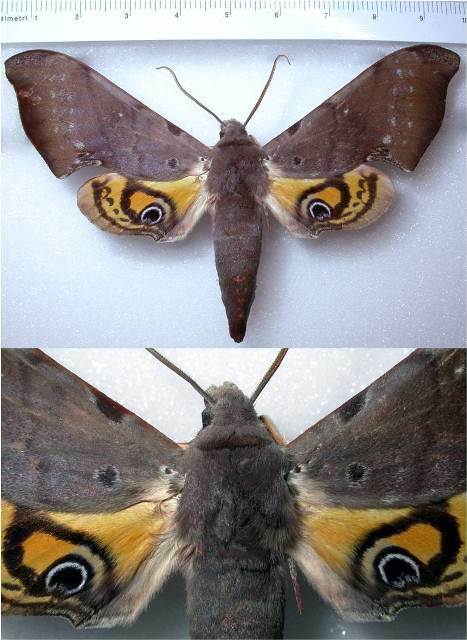 This stunning hawkmoth is Compsulyx cochereaui, an endemic species of New Caledonia. Eye-spots are also found on the hind-wings of the species of hawkmoths belonging to the genus Smerinthus. 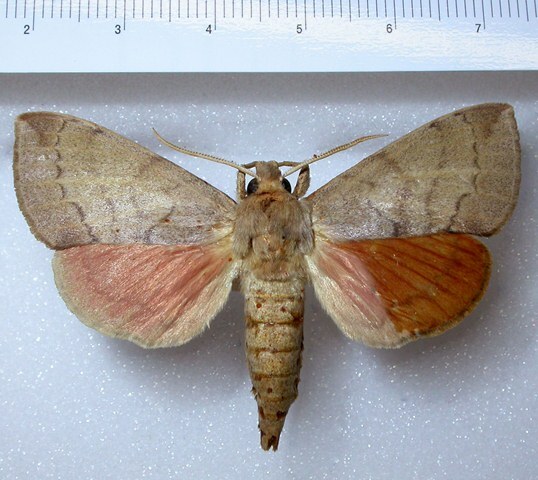 This genus includes 11 species and one of them is the eyed hawkmoth (Smerinthus ocellata). In the resting position the fore-wings cover the hind-wings with the eye spots, when the moth feels threatened, the fore-wings are suddenly pushed upward revealing the hind-wings decorated with intense blue and black 'eyes' on a pinkish and brown background. The flashing of these false eye-spots may help in startling a potential predator giving the moth a chance to quickly fly away. The eyed hawkmoth is distributed across all of Europe (including the UK), through to Russia as far east as the Ob valley and to eastern Kazakhstan and the Altai. It has also been recorded in north and western China. It doesn’t look particularly streamlined nor are its wings elongated like those of a typical hawkmoth. 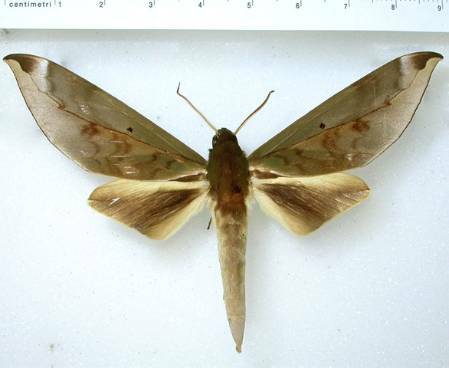 In fact when in 1855, Francis Walker - while studying specimens and describing new species from our Museum - came across a specimen of this hawkmoth, he recognized it as a new species but named it Lymantria mutata, thinking it belonged to the family of moths called Lymantriidae (Tussock moths). 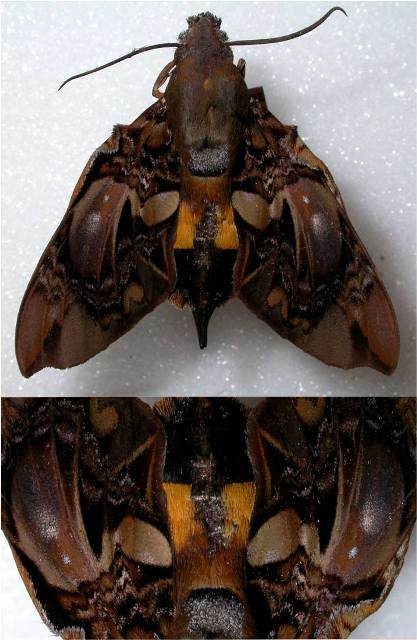 Hayesiana triopus is a lovely daily flying sphingid with translucent wings and a discontinuous pinkish-red belt and orange spots on a black abdomen. The underside of the body, particularly of the thorax, abdomen and hind wings is reddish orange. This moth is a fast flyer but its rapid movements seem rather clumsy and, apparently, it's not particularly precise when aiming the proboscis into a flower. 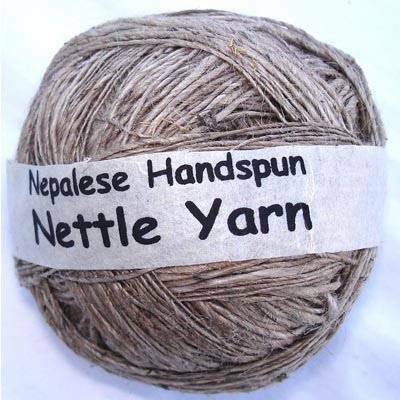 It is distributed in Nepal, northeastern India, southern China, and Thailand. Callionima inuus is certainly a very elegant hawkmoth thanks to the decorations on its forewings. The scale pattern forms motifs which resembles a cover of cobwebs blended with small, dark and light brown wavy markings; there is also a patch of silver scales in the shape of a plump and twisted “Y”. The pattern is beautiful, but most of all indispensable, for perfectly disguising this moth in the environment where it lives. This species is well distributed in the entire Neotropical region, from Mexico to Argentina. Another master of disguise is Phylloxiphia oberthueri. When in the resting position, hanging from a plant, this hawkmoth looks very convincingly like a bunch of dry leaves. This species is distributed through West Africa. Doesn’t Hypaedalea insignis look like the vehicle of a superhero character? An innovative hawkmoth bat-car! But again, this pattern has not evolved to impress we humans; the amazing discontinuous and wavy lines and blotches, coloured with different tints of brown and grey, are all essential for making this hawkmoth hard to spot against the vegetation. This moth is distributed in West Africa. The Museum's collections are based on Sir Hans Sloane’s collection which was purchased by the British Museum in 1753. Amongst them were his entomological holdings, with around 5,500 specimens including Lepidoptera, and thus were the earliest Sphingidae housed in the Museum. 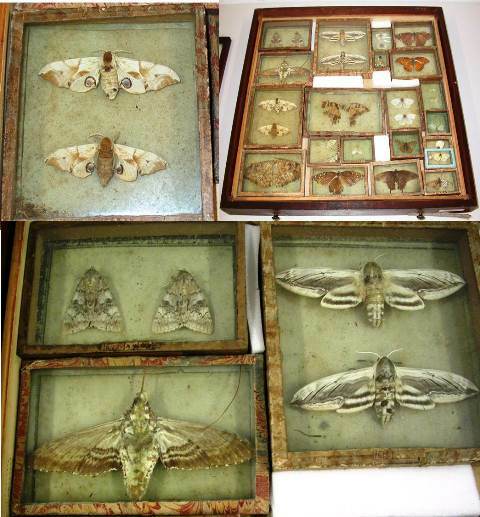 A drawer with specimens of Lepidoptera from the original collection of Sir Hans Sloane. The hawkmoths in this drawer (Smerinthus ocellata in the top left, Agrius convolvuli and Sphinx ligustri bottom left and right respectively) were collected more than 350 years ago and are amongst the oldest Lepidoptera specimens in our collections. Afterwards, the earliest and most significant benefactors who presented Lepidoptera - and particularly Sphingidae - to the Museum were, Horsfield, the Honorable East India Company, and Museum appointees like Edward Doubleday. Later 19th Century benefactors of major significance were Bates, Wallace, Stainton, Zeller, Bainbrigge-Fletcher, Hewitson, Leech and Godman and Salvin. And in the 20th Century the sphingids holdings of the Museum were to be enriched with the collections of Lord Walsingham, Swinhoe, Moore, Joicey, Levick, Lord Lionel Walter Rothschild, Cockayne and Kettlewell, Inoue and others. Some of the most significant donors of Lepidoptera (and particularly of Sphingidae) to the Museum. The date of acquisition, the number of specimens and some of the history behind each of these valuable collections of moths and butterflies is often well documented, but it is much more difficult to know the exact number of specimens of any particular family that came with any of them. However, we know that the majority of the hawkmoths - around 45,000 specimens - came to the Museum in 1939 when Lord Rothschild bequested approximately 2.5 million specimens of Lepidoptera. 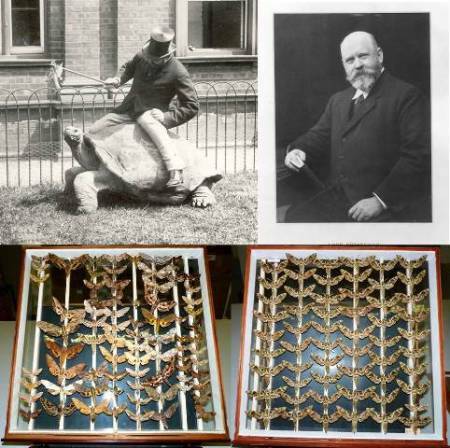 Lord Lionel Walter Rothschild was a keen naturalist who went on to amass one of the greatest collections of animals ever assembled by an individual. 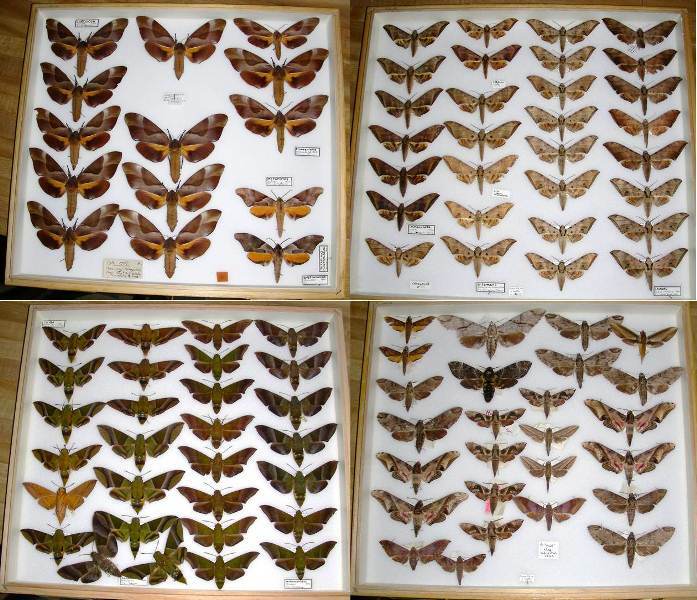 In 1939 around 2.5 million specimens of butterflies and moths from the Rothschild collection, were entrusted to the Museum in thousands of drawers. Two of these drawers, containing hawkmoths, are shown in the picture. This is the reference collection and contains drawers with type specimens and representative series of any particular family, often of the oldest material. 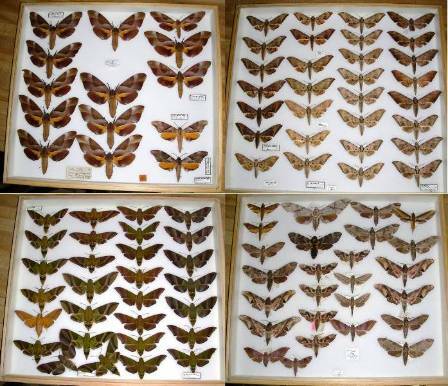 In the picture, one of the main collection drawers with the hawkmoth Callionima inuus. It contains other specimens, belonging to any particular family, of identified material which arrived later and for which there was not space in the main collection. 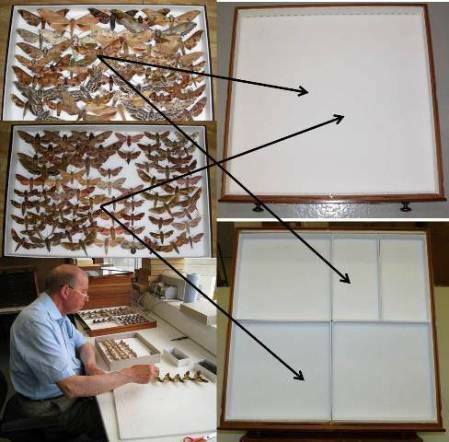 In the picture, one of the supplementary drawers with the hawkmoth Agrius convolvuli. It contains unsorted and often unidentified material which was later added to the family. 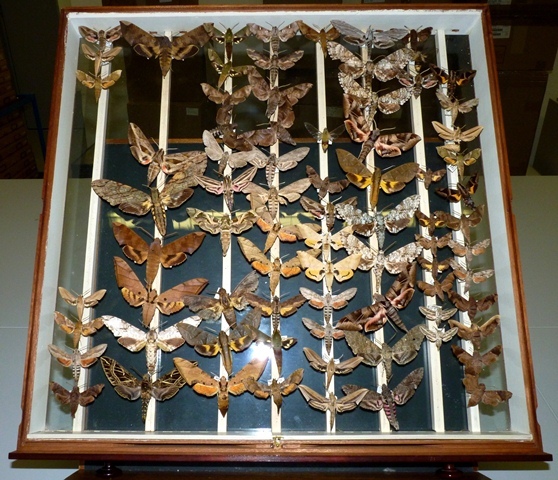 In the picture, one of the accession drawers with different species of hawkmoths from the original Rothschild Collection. The British & Irish Collection. It contains specimens of the 20 species of Sphingidae occurring in the British Isles. In the picture, one of the British and Irish Collection drawers with the hawkmoth Daphnis nerii. Only relatively recently we began to amalgamate all specimens from the main, supplementary and accession collections into one collection for each family. Each of the 5 curators in the Lepidoptera section is responsible, amongst other things, of the re-housing of one or more families of moths and butterflies. With a collection of almost 9 million specimens and around 135 families of Lepidoptera to take into account the work to do can seem endless; it will certainly take a long time and a lot of effort before this is accomplished, but slowly and surely we are improving the care, storage and accessibility of our collections. 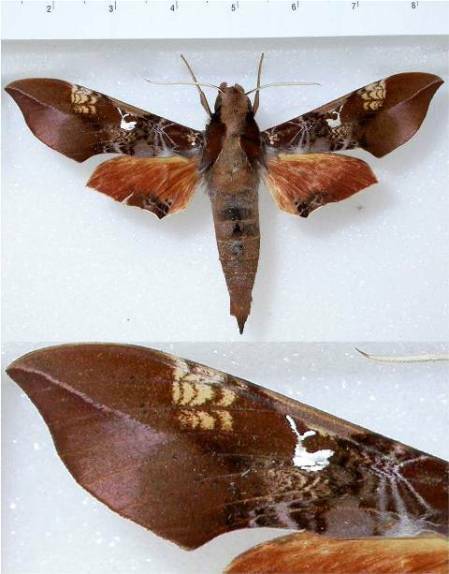 In August 2008, thanks to the generous sponsorship of the Rothschild family, the de Rothschild family, the John Spedan Lewis foundation, Ernest Kleinwort Charitable Trust and members of the public, the Museum was able to acquire one of the largest private collections of Sphingidae, the Jean-Marie Cadiou collection. And it’s about this prodigious private Collection, containig a staggering total of around 230,000 specimens, the majority of which are sphingids, that I will be telling you in my next post. Make sure to come back then. Alessandro Giusti is a Curator of Lepidoptera in the Department of Life Sciences.